Designed by John Barr. The Tung Teaser is an excellent all purpose nymph that is heavily weighted. The pattern was inspired by the Prince Nymph but John wanted something more durable while maintaining the colorations of Peacock, Brown, and White. He chose Arizona Synthetic Peacock Dubbing for the body as it retains many of the Peacock colorations when wet and is very durable. 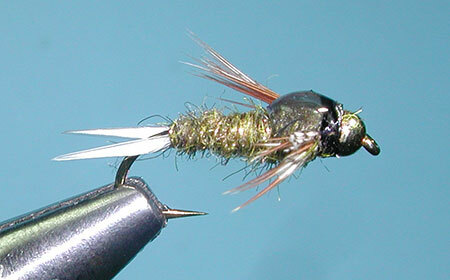 The pattern can be used as a large mayfly nymph,ie Green Drakes, or a smaller stonefly nymph as it combines many of the effective features of a good nymph pattern with biot tails, epoxy back, and hackle legs. The Tung Teaser pattern is especially productive during low light hours when nymphs are redistributing themselves during natural behavioral drift cycles and are exposed to trout. These cycles are heaviest during spring and fall months. On rivers that contain large populations of stoneflies, this fly imitates the many of the stonefly nymphs that are most prevalent in the drift. The pattern is often fished within a multiple fly rig as the second or third fly. Bead size suggestions are 7/64" for size 12, 3/32" for sizes 14-16 and 5/64" for size 18.